DAX is a write-through caching service, designed to simplify the process of adding a cache to Amazon DynamoDB tables. Because DAX operates separately from DynamoDB, it is important that you understand the consistency models of both DAX and DynamoDB to ensure that your application behaves as you expect. In many use cases, the way that your application uses DAX will affect the consistency of data within the DAX cluster, as well as the consistency of data between DAX and DynamoDB. To achieve high availability for your application, we recommend that you provision your DAX cluster with at least three nodes and place those nodes in multiple availability zones within a region. When your DAX cluster is running, it will replicate the data among all of the nodes in the cluster (assuming that you have provisioned more than one node). Consider an application that performs a successful UpdateItem using DAX. This causes the item cache in the primary node to be modified with the new value; that value will then be replicated to all of the other nodes in the cluster. This replication is eventually consistent, and usually takes less than one second to complete. If you are building an application that uses DAX, that application should be designed in such a way that it can tolerate eventually consistent data. Every DAX cluster has two distinct caches—an item cache and a query cache. (For more information, see Concepts.) This section addresses the consistency implications of reading from and writing to the DAX item cache. With Amazon DynamoDB, the GetItem operation performs an eventually consistent read by default. If you use UpdateItem with the DynamoDB client, and then attempt to read the same item immediately afterward, you might see the data as it appeared prior to the update. This is due to propagation delay across all of the DynamoDB storage locations. Consistency is usually reached within seconds, so if you retry the read, you will likely see the updated item. The DAX client issues a GetItem request. DAX attempts to read the requested item from the item cache. If the item is in the cache (cache hit), DAX returns it to the application. If the item is not available (cache miss), DAX performs an eventually consistent GetItem operation against DynamoDB. DynamoDB returns the requested item, and DAX stores it in the item cache. DAX returns the item to the application. (not shown) If the DAX cluster contains more than one node, the item is replicated to all of the other nodes in the cluster. The item will remain in the DAX item cache, subject to the TTL setting and LRU algorithm for the cache (see Concepts). However, during this period, DAX will not re-read the item from DynamoDB. If someone else updates the item using a DynamoDB client, bypassing DAX entirely, then a GetItem request using the DAX client will yield different results from the same GetItem request using the DynamoDB client. In this scenario, DAX and DynamoDB will hold inconsistent values for the same key until the TTL for the DAX item has expired. If an application modifies data in an underlying DynamoDB table, bypassing DAX, the application will need to anticipate and tolerate data inconsistencies that might arise. In addition to GetItem, the DAX client also supports BatchGetItem requests. BatchGetItem is essentially a wrapper around one or more GetItem requests, so DAX treats each of these as an individual GetItem operation. DAX is a write-through cache, which simplifies the process of keeping the DAX item cache consistent with the underlying DynamoDB tables. The DAX client supports the same write API operations as DynamoDB (PutItem, UpdateItem, DeleteItem, and BatchWriteItem, and TransactWriteItems). When you use these operations with the DAX client, the items are modified in both DAX and DynamoDB. DAX updates the items in its item cache, regardless of the TTL value for these items. For example, suppose you issue a GetItem request from the DAX client to read an item from the ProductCatalog table. (The partition key is Id; there is no sort key.) You retrieve the item whose Id is 101; the QuantityOnHand value for that item is 42. DAX stores the item in its item cache with a specific TTL; for this example, let us assume that the TTL is ten minutes. Three minutes later, another application uses the DAX client to update the same item, so that its QuantityOnHand value is now 41. Assuming that the item is not updated again, any subsequent reads of the same item during the next ten minutes will return the cached value for QuantityOnHand (41). DAX is intended for applications that require high-performance reads. As a write-through cache, DAX allows you to issue writes directly, so that your writes are immediately reflected in the item cache. You do not need to manage cache invalidation logic, because DAX handles it for you. DAX supports the following write operations: PutItem, UpdateItem, DeleteItem, BatchWriteItem, and TransactWriteItems. DAX sends the request to DynamoDB. DynamoDB replies to DAX, confirming that the write succeeded. DAX writes the item to its item cache. DAX returns success to the requester. DynamoDB replies to DAX, confirming that the transaction completed. In the background, DAX makes a TransactGetItems request for each item in the TransactWriteItems request to store the item in the item cache. TransactGetItems is used to ensure serializable isolation. If a write to DynamoDB fails for any reason, including throttling, then the item will not be cached in DAX and the exception for the failure will be returned to the requester. This ensures that data is not written to the DAX cache unless it is first written successfully to DynamoDB. DAX caches the results from Query and Scan requests in its query cache; however, these results do not affect the item cache at all. When your application issues a Query or Scan request with DAX, the result set is saved in the query cache—not in the item cache. You cannot "warm up" the item cache by performing a Scan operation, because the item cache and query cache are separate entities. Updates to the item cache, or to the underlying DynamoDB table, do not invalidate or modify the results stored in the query cache. To illustrate, consider the following scenario where an application is working with a table named DocumentRevisions, which has DocId as its partition key and RevisionNumber as its sort key. A client issues a Query for DocId 101, for all items with RevisionNumber is greater than or equal to 5. DAX stores the result set in the query cache, and returns the result set to the user. The client issues a PutItem request for DocId 101 with a RevisionNumber value of 20. The client issues the same Query as described in step 1 (DocId 101 and RevisionNumber >= 5). In this scenario, the cached result set for the Query issued in step 3 will be identical to the result set that was cached in step 1. The reason is that DAX does not invalidate Query or Scan result sets based upon updates to individual items. The PutItem operation from step 2 will only be reflected in the DAX query cache when the TTL for the Query expires. Your application should consider the TTL value for the query cache, and how long your application is able to tolerate inconsistent results between the query cache and the item cache. To perform a strongly consistent GetItem, BatchGetItem, Query, or Scan request, you set the ConsistentRead parameter to true. DAX passes strongly consistent read requests to DynamoDB. When it receives a response from DynamoDB, DAX returns the results to the client, but it does not cache the results. DAX cannot serve strongly consistent reads by itself, because it is not tightly coupled to DynamoDB. For this reason, any subsequent reads from DAX would have to be eventually consistent reads, and any subsequent strongly consistent reads would have to be passed through to DynamoDB. DAX handles TransactGetItems requests the same way it handles strongly consistent reads. DAX passes all TransactGetItems requests to DynamoDB. When it receives a response from DynamoDB, DAX returns the results to the client, but it does not cache the results. 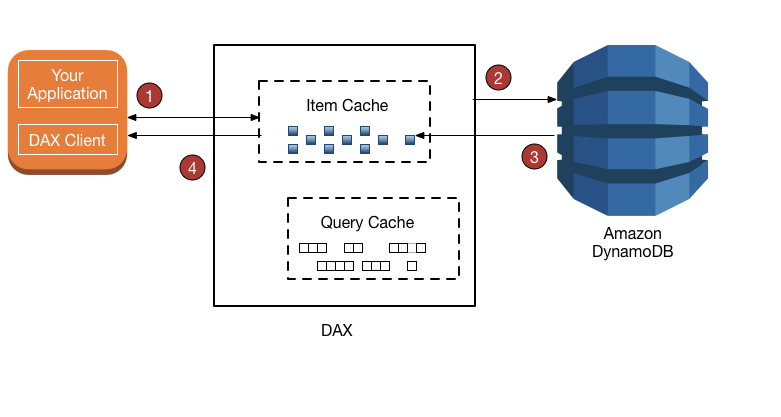 DAX supports negative cache entries, in both the item cache and the query cache. A negative cache entry occurs when DAX cannot find requested items in an underlying DynamoDB table. Instead of generating an error, DAX caches an empty result and returns that result to the user. For example, suppose that an application sends a GetItem request to a DAX cluster, and that there is no matching item in the DAX item cache. This will cause DAX to read the corresponding item from the underlying DynamoDB table. If the item does not exist in DynamoDB, then DAX will store an empty item in its item cache, and then return the empty item to the application. Now suppose the application sends another GetItem request for the same item. DAX will find the empty item in the item cache, and return it to the application immediately. It does not consult DynamoDB at all. A negative cache entry will remain in the DAX item cache until its item TTL has expired, LRU is invoked, or until the item is modified using PutItem, UpdateItem or DeleteItem. The DAX query cache handles negative cache results in a similar way. 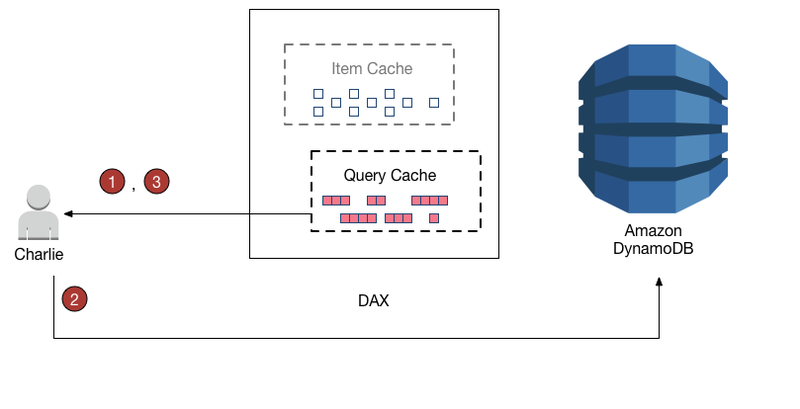 If an application performs a Query or Scan, and the DAX query cache does not contain a cached result, then DAX sends the request to DynamoDB. If there are no matching items in the result set, then DAX stores an empty result set in the query cache, and returns the empty result set to the application. Subsequent Query or Scan requests will yield the same (empty) result set, until the TTL for that result set has expired. The write-through behavior of DAX is appropriate for many application patterns. However, there are some application patterns where a write-through model might not be appropriate. For write-intensive applications (such as those that perform bulk data loading), it might not be desirable to write all of the data through DAX because only a very small percentage of that data is ever read by the application. When you write large amounts of data through DAX, it must invoke its LRU algorithm to make room in the cache for the new items to be read. This diminishes the effectiveness of DAX as a read cache. When you write an item to DAX, the item cache state is altered to accommodate the new item. (For example, DAX might need to evict older data from the item cache to make room for the new item.) The new item remains in the item cache, subject to the cache's LRU algorithm and the TTL setting for the cache. As long as the item persists in the item cache, DAX will not re-read the item from DynamoDB. The DAX item cache implements a write-through policy (see How DAX Processes Writes). When you write an item, DAX ensures that the cached item is synchronized with the item as it exists in DynamoDB. This is helpful for applications that need to re-read an item immediately after writing it. However, if other applications write directly to a DynamoDB table, the item in the DAX item cache will no longer be in sync with DynamoDB. To illustrate, consider two users (Alice and Bob) who are working with the ProductCatalog table. Alice accesses the table using DAX, but Bob bypasses DAX and accesses the table directly in DynamoDB. Alice updates an item in the ProductCatalog table. DAX forwards the request to DynamoDB, and the update succeeds. DAX then writes the item to its item cache, and returns a successful response to Alice. From that point on, until the item is ultimately evicted from the cache, any user who reads the item from DAX will see the item with Alice's update. A short time later, Bob updates the same ProductCatalog item that Alice wrote—however, Bob updates the item directly in DynamoDB. DAX does not automatically refresh its item cache in response to updates via DynamoDB; therefore, DAX users do not see Bob's update. Alice reads the item from DAX again. 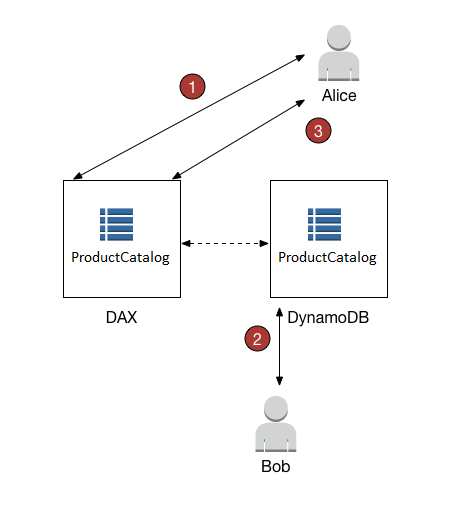 The item is in the item cache, so DAX returns it to Alice without accessing the DynamoDB table. In this scenario, Alice and Bob will see different representations of the same ProductCatalog item. This will be the case until DAX evicts the item from the item cache, or until another user updates the same item again using DAX. If your application needs to write large quantities of data (such as a bulk data load), it might make sense to bypass DAX and write the data directly to DynamoDB. Such a write-around strategy will reduce write latency; however, the item cache will not remain in sync with the data in DynamoDB. If you decide to use a write-around strategy, remember that DAX will populate its item cache whenever applications use the DAX client to read data. This can be advantageous in some cases, because it ensures that only the most frequently-read data is cached (as opposed to the most-frequently written data). For example, consider a user (Charlie) who wants to work with a different table, the GameScores table using DAX. The partition key for GameScores is UserId, so all of Charlie's scores would have the same UserId. Charlie wants to retrieve all of his scores, so he sends a Query to DAX. Assuming that this query has not been issued before, DAX forwards the query to DynamoDB for processing, stores the results in the DAX query cache, and then returns the results to Charlie. The result set will remain available in the query cache until it is evicted. Now suppose that Charlie plays the Meteor Blasters game and achieves a high score. Charlie sends an UpdateItem request to DynamoDB, modifying an item in the GameScores table. DAX does not refresh result sets in the query cache with the most current data from DynamoDB. Each result set in the query cache is current as of the time that the Query or Scan operation was performed. Thus, Charlie's Query results do not reflect his PutItem operation. This will be the case until DAX evicts the result set from the query cache.